This beautiful Set of 5 Simple Poppies wall decals are sure to brighten up any room you choose to put them in! Our wall decals are ideal for offices, living rooms, entryways, classrooms, even your car or glass shower doors! Sizes vary in size from 10 - 10.5 inches wide by 31 - 60 inches tall. As shown, our simple poppies measure 19 inches wide by 60 inches tall. Color shown- Cardinal Red matte. 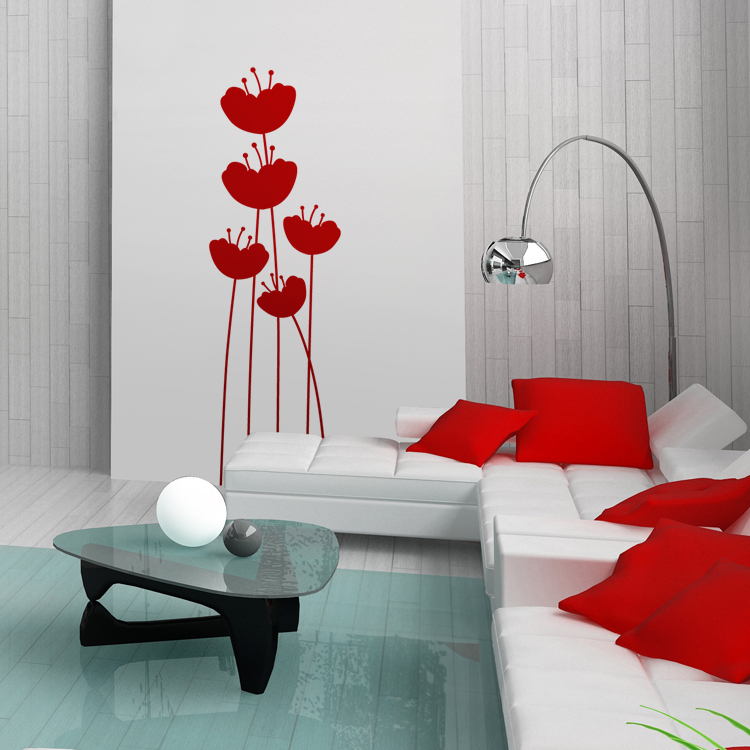 Our Simple Poppies wall decals come separately so you can place them however you choose! Wonderful customer service and very fast shipping. The colors of my tree are beautiful and the quality of the vinyl is great. I would definitely purchase from DaliDecals again! I just had to write in and let everyone know how easy these are to use! I thought it was going to be difficult but it really is super easy! My decal looks great! Wish I would have done it a long time ago! Simply put, Dali Decals exceeded my expectations. The quality of the product (Alphabet Tree) and customer service are second to none. Kudos to the team and keep up the great work. I will be sure to share your information with my family and friends. Thank you so much for the cute decals. They add so much fun to my daughter's room!! I will definitely order again and refer your company to my family and friends! I am really impressed with the quality of the decals and prompt delivery…However, I am more impressed that Marisa contacted me to ask some questions since I wasn’t very thorough in my details. That is what customer service is about. You and your husband have a great business. I wish you success.